Making its debut in 1964 with Hasbro, the GI Joe franchise is a time-tested staple of pop culture. There are four main action figures meant to represent each branch of the military. Some years after its launch, Hasbro also created an Action Nurse to honor and represent military medics. 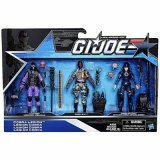 GI Joe figurines are fun, classic collectibles that are great for any age. We know it can be hard to track down items from the actual GI Joe line (instead of one of the off-brand competitors) so we’ve collected ten of our favorite authentic GI Joe toys for you below! The search for the best GI Joe toys ends here. Our brand new buying guide format is equipped to give you all the details on the best products on the market! GI Joe toys are a hot commodity! In order to keep up with the market, our research team frequently revises this guide to ensure it reflects only fully stocked, quality GI Joe toys. In our most recent update, we’ve added one 50th Anniversary set, a 25th Anniversary set, and a figure from the GI Joe Retaliation line. More than 50 years old, the GI Joe franchise is still enthralling children the world over. We have updated our list of the 10 best to include quite a few new GI Joe figures and accessories and have reviewed all pertinent product information for veracity and accuracy and updated where necessary. With more characters to play as, this set stimulates children’s imaginations and allows them to engage in role-playing activities, expanding their sense of empathy and teaching them how to express themselves in different manners. In total, this set includes three action figures, 25 accessories, and six file cards. 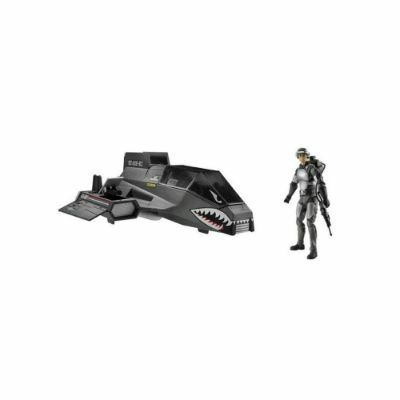 That’s a lot of bang for your buck--literally, given that the female Cobra Officer comes with two mines, a rifle, a bazooka launcher, a backpack, and a removable helmet. 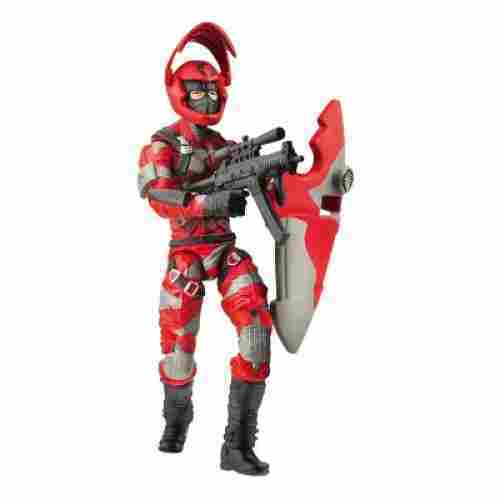 The SAW Viper likewise has a removable helmet, but his weapons options are a pistol, knife, rifle, machine gun, and a clip of bullets. 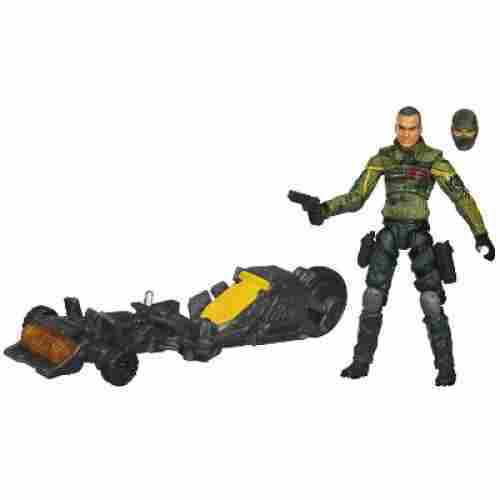 And the Cobra BAT has his own removable chest cover, backpack, and an arm attachment. This set gives you three new characters to play with and a whole assortment of different accessories. Since they’re all the standard 3.75”, they and their accessories should be compatible with other Anniversary Edition toys as well. All figures at the standard 3.75” size and so compatible with other Anniversary sets. They move well for action toys, are made of durable plastic, and are painted with attention to detail. If you’re looking for a starter set to go with your GI Joe heroes, this pack gives you quite a few options to make adventures all the more interesting. Defenders of freedom will have their hands full with this fierce terrorist agent. Adept at metropolitan warfare, this killer lurks in the darkness of city streets, waiting for the perfect moment to take his enemies by surprise. The figure’s striking red color scheme is dazzling and gives the character an almost electrifying appearance. This model’s combination of exciting features make it a very popular choice among parents. This soldier comes prepared with his weapons that include an assault rifle and a pair of nunchucks. He is more than capable of defending himself thanks to his large shield that can be attached to his arm in preparations for battle. 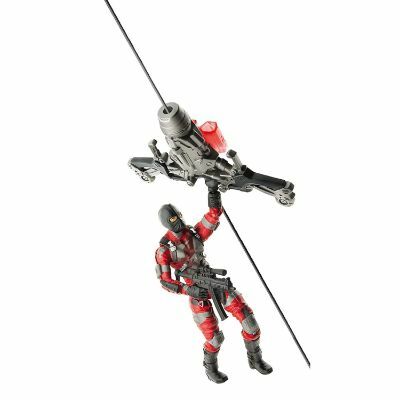 This figure also comes with its own zip line that can be extended up to seven feet for a rip-roaring time. Watch him race down the zip line as he hangs onto his pulley, closing in on his unsuspecting targets. 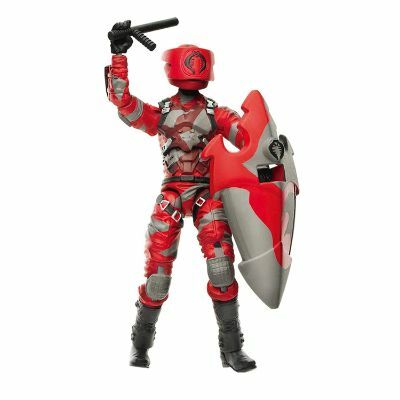 Kids will love the fact that they can choose to remove the helmet whenever they want, and this model’s excellent joint flexibility means they can enjoy creating all kinds of intriguing action scenarios to conquer. This figurine has a bit of history behind it; the same character model was released way back in 2009 in honor of the toy empire’s 25th anniversary, but with a slightly different appearance and color pattern. This one is a nod to the original, but with new and improved abilities. 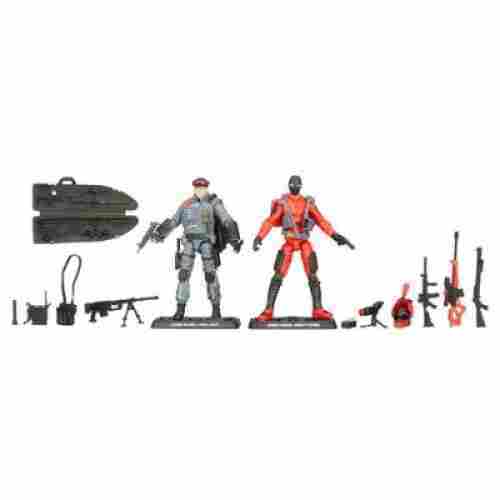 These GI Joe figurines are wonderfully articulated and come with tons of accessories. 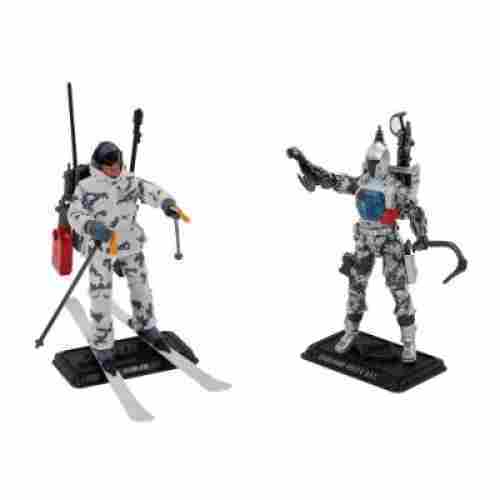 The set includes Snow Job and an Arctic B.A.T. squaring off for the 50th anniversary of the franchise. A variety of survival gear and guns accompany them. You can even make a tent out of Snow Job’s skis and blanket, though instructions for that are not included. These little action figures hold up well against rough play and celebrate GI Joe with quality and in style. These are great little additions to any GI Joe collection. Their cool gear and accessories are what set them apart, giving kids lots of inspiration during play. Imaginative play helps children to empathize and express themselves creatively. 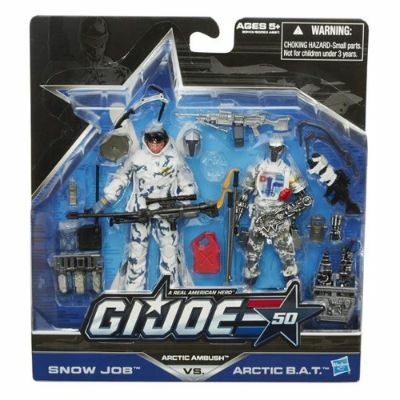 These action figures set them up for all kinds of fun Arctic adventures as the two duke it out in the great Arctic wilderness. Creative play can help children to develop social skills, empathy, advanced communication, and confidence. 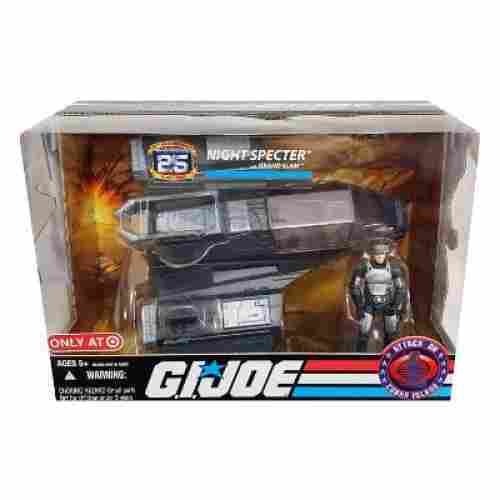 These GI Joes are a perfect gift for kids or adults alike who are enthusiastic fans of the original franchise and its many offshoots. This special 50th Anniversary Pack contains both Light Light and Night Viper. They both come with multiple accessories fitted to them, including weapons, a walkie talkie, additional armor, and more. These figurines are small but they’re well-armed with tons of accessories and they work well as display pieces and actual action figures. They’re from a pretty limited edition run of toys, so grab them while you still can! With a low production run, this set is a valuable collector’s item. It comes fully packaged and unopened, with all pieces intact. These figurines feature typical articulation and both come with their own stand for display. The munitions expert of the Cobra team, this enemy soldier is a formidable opponent that should not be underestimated. Our heroes must beware of his unique battle tactics that include a rapid board launcher and explosive weaponry. With the extra attachable head included, you can quickly change him into his mysterious ninja disguise to hide his identity. Stand back and get ready for take off, because this one is ready to charge! No need to manually maneuver this figure in and out of battle positions, because his mobile launching board is fully powered by batteries, which are luckily already included! When you’re ready to fire, just eject the deadly explosive canister from the front of the launching board, and you’ll have unleashed a devastating enemy attack. For added dramatic effect, the launch board can even light up with the simple push of a button. The GI Joe team better brush up on their defense tactics if they want to survive the deadly attack of this soldier and his explosive weaponry! This figure is different in that it doesn’t include a bunch of exotic weaponry. We like that it presents a character more focused on a particular specialization, which is more realistic and ups the suspense in an imaginary war situation. One of the deadliest killers on the Cobra team, this soldier is a terrifying hybrid of advanced robotic technology and ancient martial arts. His ability to become invisible is a serious threat to our American heroes because he can carry out murderous attacks at any moment. 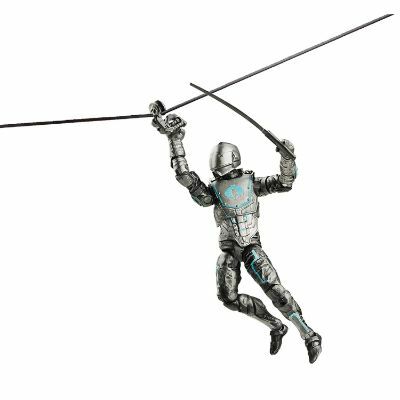 Get ready to fly high, because this soldier comes with his own zip line that can attach to different surfaces with suction cups, so you can watch him glide effortlessly through the air. With fully movable joints covering the entire body, your child can easily twist and turn this figure into multiple positions and poses. The included weapons also reflect perfectly this character’s blend of east and west; armed with both assault guns and a traditional martial arts sword, this ninja warrior is as dangerous as they come. Kids love this character’s rare hybrid nature of new and old fighting traditions that make him unlike any other action figure in the series. This figurine can top off a growing Cobra army very nicely because of its visual appeal and tech-inspired nature. With this toy, you get a quality figurine that can withstand tough handling at an affordable price point. This Ninja’s codename is Storm Shadow and it’s no wonder: given his mastery of martial arts and his sleek white costume, he could slip through the snow unnoticed, scarcely leaving a footprint behind. He comes with a bow and arrow, knife, and samurai sword. Storm Shadow has a rich backstory involving betrayal, secrecy, loyalty to one’s roots, and the eventual epiphany that vengeance brings little joy to anyone. This figurine is the perfect toy for kids who love Storm Shadow and can’t wait to make their own adventures with him. This is a great little model for fans of the cartoon. The costuming is a little different but the figurine is well made and a solid collectible for fans of the Joe franchise or Storm Shadow as a standalone character. Originally, he served with Snake Eyes in Southeast Asia and eventually infiltrated Cobra’s ranks to avenge the death of his uncle. Realizing that there was no joy in that, he retired but will still come out to help the Joes if Snake Eyes asks politely enough. 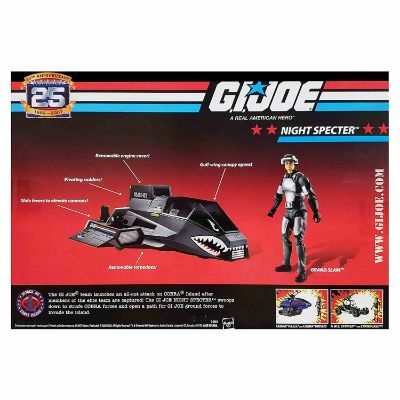 A new take on the Joes’ original GI Joe SHARC, this vehicle comes in a dark matte black which makes it perfect for night ops. It features a gull-wing canopy, which users can open, as well as a removable engine cover. Pivoting rudders add flare to this tank, and removable torpedoes make it a force to be reckoned with. Side levers elevate the cannons, giving Joes a vantage point. This toy is best suited for ages 5 and up, and is compatible with most modern GI Joe toys, specifically any 3.75” action figures. The kit includes its own standard Joe from the 25th Anniversary series. This vehicle has lots of little moving parts that kids will love. Using the various levers, wheels, and rudders will help improve their motor skills. 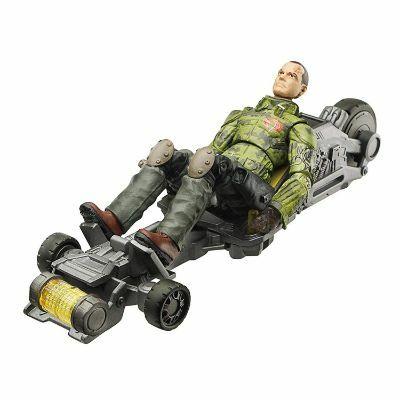 The vehicle can fit the standard 3.75” GI Joe figurines, making it a great accessory for creative play. This vehicle has lots of fun operational bits and moving pieces. 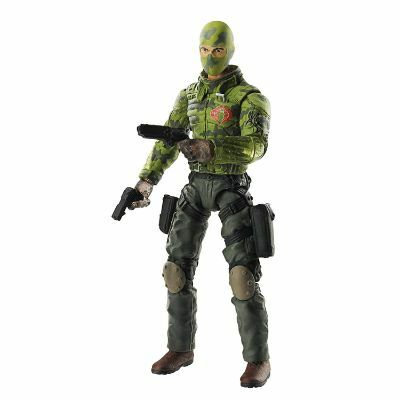 It includes a standard action figure, which is nice, but also is compatible with basically any contemporary GI Joe, since they all are the standard 3.75” size. The characters from the hit movie of the same name come to life in this fearsome line of action figures. Featuring an attachable zip line with the length being more than five feet, this enemy ninja can have the edge over his opponents by engaging in surprise attacks from above. Send him flying across the rigged up zip line with weapons in hand, and he is almost unstoppable! Your child can now act out a variety of battle simulations based on the actual movie plot, and owning an action figure like this one is a must! One of the Cobra Command’s most deadly assassins, this figure is ready to use his expert ninja fighting skills to take down the heroes. 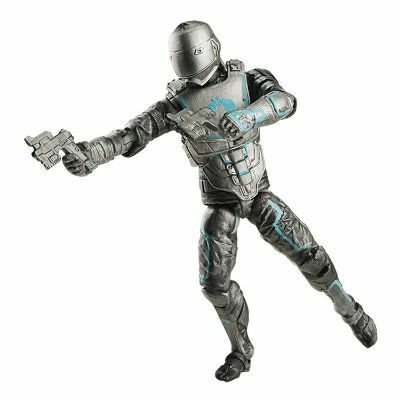 With fully bendable joints, this highly trained enemy agent is able to kick, punch, and twist while he fights off the good guys. If your child has never seen the movie, make it more exciting by getting them this essential action figure so they can play with it while watching the film! The sleek white, black, and grey color scheme is eye-catching to say the least, and gives this figure a commanding appearance. Because this one has minimal accessories besides the zipline, that means there are less small parts to worry about, making playtime easier on you. Cobra is out there and ready to cause mayhem. Only GI Joe and his team of specially trained fighters can stop them! 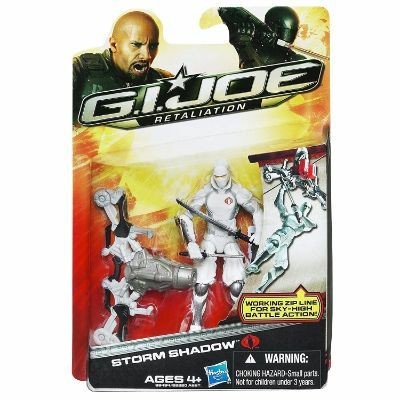 This GI Joe retaliation figurine stands at 3.75” and is fully articulated, meaning he is ready for battle! He fits in the fun sea, land, and air vehicles made for the Retaliation line and can use the accessories and fight alongside other Retaliation figurines as well. 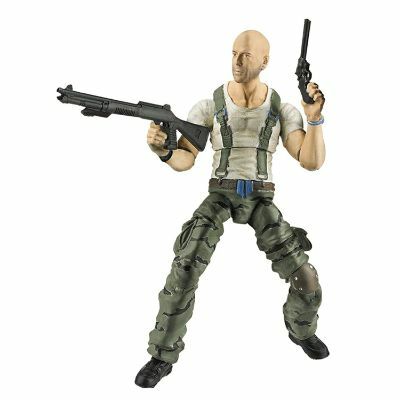 In the stylings of the 2013 movie, this action Joe looks just like Bruce Willis. If you saw the 2013 blockbuster, your family may be a fan of thrilling action movies. This figurine is the perfect accessory for kids to reenact their favorite scenes or make new adventures of their own! Fully packaged and in excellent condition, this is a great buy for fans of the movie and the classic Joe franchise alike. He’s not an original Joe but he does look like the 2013 reiteration and he moves well, which is a bonus given that some toy companies (Hasbro among them) have cut back on the articulation of their products. Not a bad Joe, and especially if you’re not keen on paying the high price on many of the original figures. When one thinks of GI Joe toys, the first thing that usually comes to mind are all the amazing weapons and accessories that come with the figures, because let’s face it; without all the cool gadgets and doodads, the figures probably wouldn’t be nearly as entertaining! We looked for the ones that came with more than just one or two weapons, and you’ll notice that several of the figures on our list come with jumbo-sized extra ammunition that enhances the character’s standard weaponry, creating an even more intense showdown! From missiles to rifles, to rockets to swords, these toys have it all and more, giving your child endless hours of thrills. The very definition of an action figure is that it must be able to move, and these toys are highly regarded for their ball joints that allow them to be manipulated in ways that most other figures aren’t capable of. With these toys, it’s not just their head and hands that can be moved; elbow joints, knees, wrists, and torsos can all be bent or twisted into the desired attack position. The figures that come with a zip line are always a hit with the kids because the figure is able to grasp and hold onto the pulley as it zips across, creating a realistic and entertaining experience for your child. There are many strong opinions on what makes something a collector’s item, including how old a toy is, its packaging, and popularity. However, knowing the immense adoration of this particular toy franchise across the world, we felt it was important to highlight the toys within the franchise that were already considered collectible, as well as the ones that have the potential to be considered a future collector’s item. 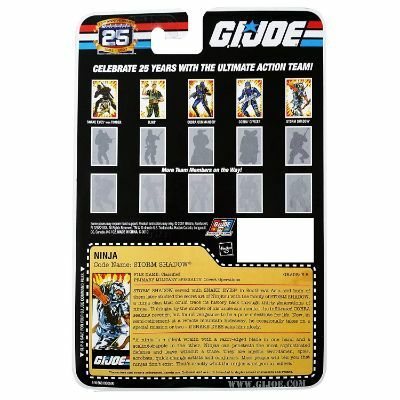 Characters like Storm Shadow are usually always in demand because of his central role in the various storylines, and anniversary sets are sure to become collector’s items, which is why you will see them included on our list. It’s always a good idea to take good care of your GI Joe figures and make sure your child does not break them due to extremely rough play. G.I. Joe features characters to represent each branch of the US military. They eventually even introduced an Action Nurse. G.I. Joe first arrived on the scene on February 2, 1964 thanks to Hasbro. The original line featured twelve-inch figures. Most fans of the franchise are familiar with almost every character ever created and can recite their rank as well as individual fighting tactics. But for those who aren’t as knowledgeable about the many different personalities within the storylines, we thought it was important to include a wide assortment of characters on our list that were not just the most popular or most famous. While we did include several mainstay characters like Storm Shadow that many recognize from the movie adaptions and comic books, some new fans may not be familiar with Firefly, for example. By presenting a wide range of characters from different storylines, we hope to give your child more options and opportunities to learn about the immense and captivating world of GI Joe. q: Why don’t all of the figurines come with a stand? This is a common question among both parents and collectors alike; if some of the figures come with a stand, many think this means there’s been a mistake when their figure doesn’t come with a stand of some kind. However, there is an explanation that has to do with the intentional design of the toy itself. Some of the box sets on our list come with stands because they include multiple figures with limited accessories, which makes these sets attractive displays when they are not in use. The figures that come with a vehicle, for example, do not usually include a stand because they are meant to be primarily more mobile than the box sets. q: What are some of the different series or versions that the GI Joe franchise has released? Due to the toy line’s rapid rise in popularity, there have been several new releases and special collector’s editions released through the years. The various movie adaptations also instigated several reboots and improvements in the action figures themselves. Some of these series include the Real American Hero, GI Joe: The Rise of Cobra, GI Joe: Retaliation, and the 25th and 50th special anniversary editions. Your family will have so much fun exploring and comparing the different series and their matching toys! q: Are the small accessories included with the action figures safe for my 4-year-old to play with? This is an understandable question that many parents have when they are thinking of purchasing a GI Joe action figure for their child. Because all of the toys on our list are recommended for ages 4 and above, it is expected that there will be reliable adult supervision at hand while the child is playing with the toy. Since the figures themselves are quite small, the weapons and accessories are also going to be very miniature in size, so it is important to supervise your child carefully when they are playing with these small parts. 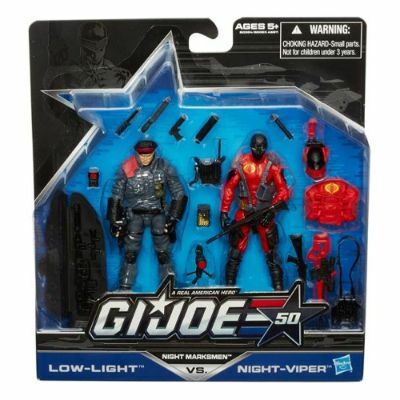 q: My child is new to GI Joe, which toy would be the best introduction to the series? That’s the great thing about this particular franchise; there’s so much to choose from! There are different opinions on what makes a good first toy to the child new to GI Joe. Some parents say their child has more fun with the larger sets that include moving accessories or parts, and that have multiple figures for more variety. 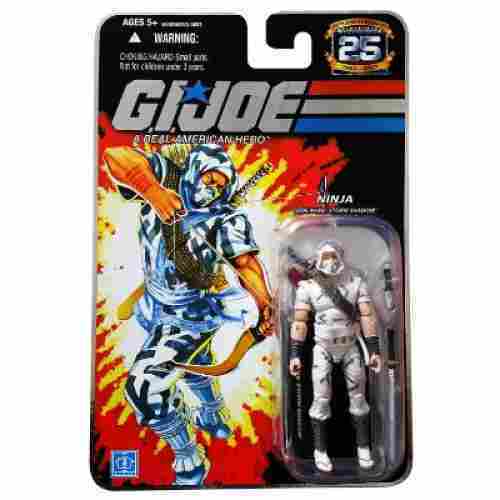 Others, however, prefer to introduce their child to the franchise more slowly by purchasing them a single figure, like the Storm Shadow one on our list. This gives the child the chance to become familiar with all the different characters and storylines at their own pace. q: Why are some of them more expensive than the others? If you scroll through these options on Amazon, you will notice there are some significant price differences. At first glance, this may seem unnecessary because the figures are all relatively the same size. However, there are some very significant differences in the toys on our list that greatly impact its final retail price. The special anniversary editions are considered to be a limited edition item, and for this reason, their price will be higher than a single action figure. Also, figures that come with moving accessories such as zip lines or vehicles tend to be priced higher as well, especially if they require batteries. The single action figure with just a couple of weapons will usually be priced the lowest unless it is a special edition. q: How do GI Joe toys teach kids about the importance of our military? These toys are not just fun to play with or interesting to look at; they are also representations of courage, valor, and sacrifice. 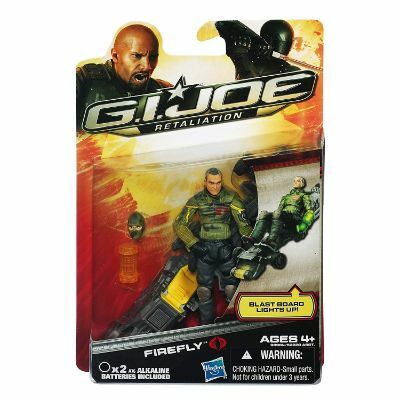 The very first Joe action figure ever created was intended to be a symbol of thanks and respect for war veterans returning home. Given the toy’s somewhat emotional origins, it is easy to see how it quickly became an international symbol, reminding us to stand up for what’s right and defend those we love. When your child becomes familiar with the long history of the characters and how they fight to protect freedom from evil villains, the metaphorical connections to real life will become clearer over time.